St. Louis’ National Hockey League (NHL) team is called the St. Louis Blues named after the W.C. Handy song, “St. Louis Blues”. They play at the Scottrade Center downtown. 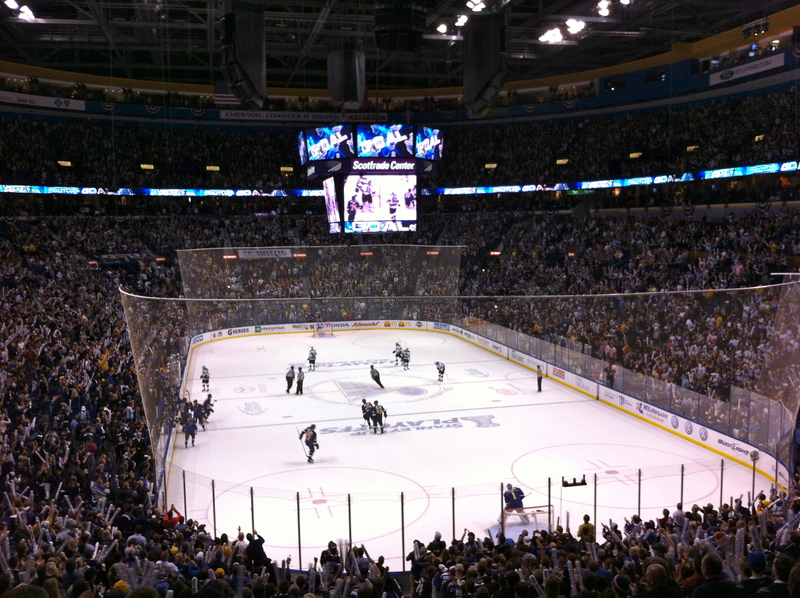 Of all 3 major professional sports teams in St. Louis, the Blues games are by far the rowdiest. Starting with the national anthem, all the fans change the end the song by singing “Home of the BLUES”. 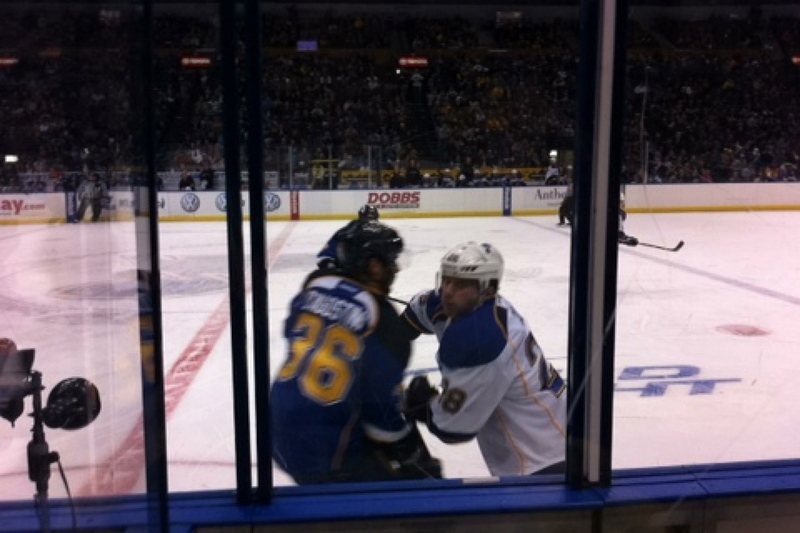 Great seats at the Blues game in January 2013. Professional hockey games are dangerous, as the players constantly hit each other at high speeds and fight. I am convinced that most hockey fans only come to the games in the hopes of seeing a fight. While most games do not sell out, the crowd is rowdy. Packed house for the Blues vs. Sharks in the first round of the Playoffs. Free Big Macs for all!!! 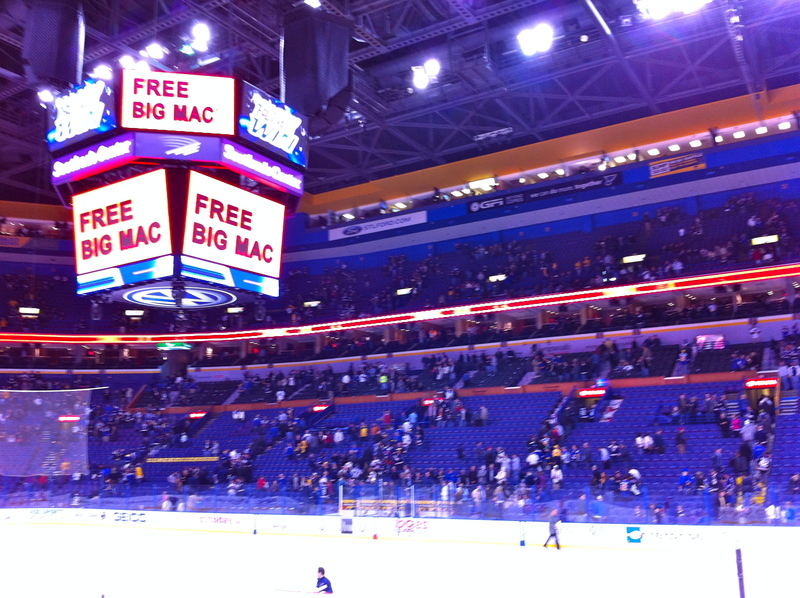 Another funny Blues tradition is the free Big Macs. If the Blues score 4 or more goals, everyone in attendance gets a coupon for a free Big Mac at any St. Louis McDonalds. Once the Blues score 3, people stop cheering “Lets Go Blues” and instead cheer “We Want Big Macs”. Blues games, are very much a part of St. Louis culture during the winter and with tickets so cheap, there’s no reason not to go to one.